YOGYAKARTA- Two delegations of the University of Newcastle visited MD FEB UGM to attend network meeting with the directors of MD FEB UGM and Dean of FEB UGM. University of Newcastle itself is one of the prestigious University located in New South Wales, Australia. The university sits in place in 224th QS world universities rank. The two delegations are: Prof. Tony Travaglione dan Prof. Shivakumaran Muthaly, who are the members of Faculty of Business and Law, University of Newcastle. Faculty of Business and Law, University of Newcastle is part of Association to Advance Collegiate Schools of Business (AACSB) same as FEB UGM. 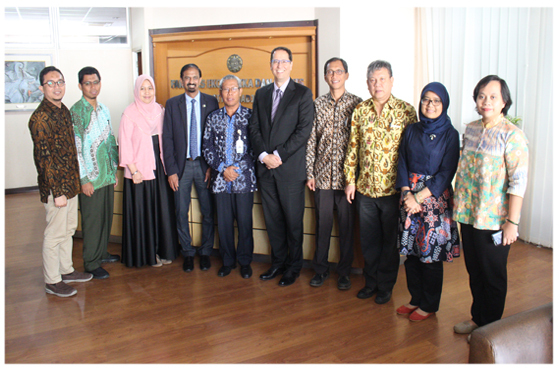 The meeting took place in MD FEB UGM Building and was attended by the Dean of FEB UGM, Dr. Eko Suwardi, Vice-dean, Dr. Amirulah Setyahadi Directors of MD FEB UGM, Director of master of science and doctor in Accounting, Prof. Jogiyanto Hartono, Director of master of science and doctor in Management, Dr. Nurul Indarti and Manager of Academic collaboration and student affair, Dr. Tur Nastiti. Agenda of the network meeting is creating a dual degree program for both master and doctoral level. The program will provide students with the opportunity to study in both MD FEB UGM and the University of Newcastle and receive degrees from both universities. The network meeting was the initial process to develop the dual degree program. In the end, both parties agreed to plan a next meeting to finalize the project.